Good morning to all!! Well just around the corner is HALLOWEEN so I decided to to a TREAT BOX..The image is a HIGH HOPES..WITCHY POO STANDING! !..I stamped her onto white card stock using MEMENTO TUXEDO BLACK INK and coloured her with COPICS and shaded with PRISMA PENCILS!! All of the markers and pencils used as well as the image can be found at the ONE CRAZY STAMPER STORE.. Also if you have some spare time and like to create join us over at the CHALLENGE BLOG..the theme is Autumn/Halloween..thks for stopping by..
Also outlined my image with MEMENTO Dual Marker Black!! 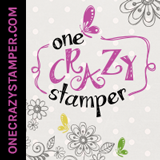 Hello and welcome once again to another "Wonderful Wednesday" here at One Crazy Stamper. It is almost the end of the month so remember you have only a couple of days to enter our "THANKSGIVING/AUTUMN" challenge for your chance to win 2 stamps from Little Darlings. I have a friend who is turning 40 next month so I had the perfect stamp from Your Next Stamp to colour up to help her celebrate. It was fun to do. I paper pieced some of it and also used a few colours of Stickles and Pearl Pens to accent it. Only two more days until the goblins will be out trick or treating so I'm wishing everyone a Happy Halloween, and my card today celebrates the season!! The image is from High Hopes Stamps and is entitled "Boo Family in Frame" available here. 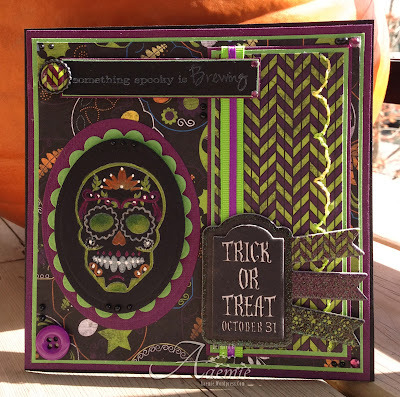 I mounted the Copic colored image on the card front made using dp from My Mind's Eye Happy Haunting collection, black twine, and a Spellbinder die graveyard. 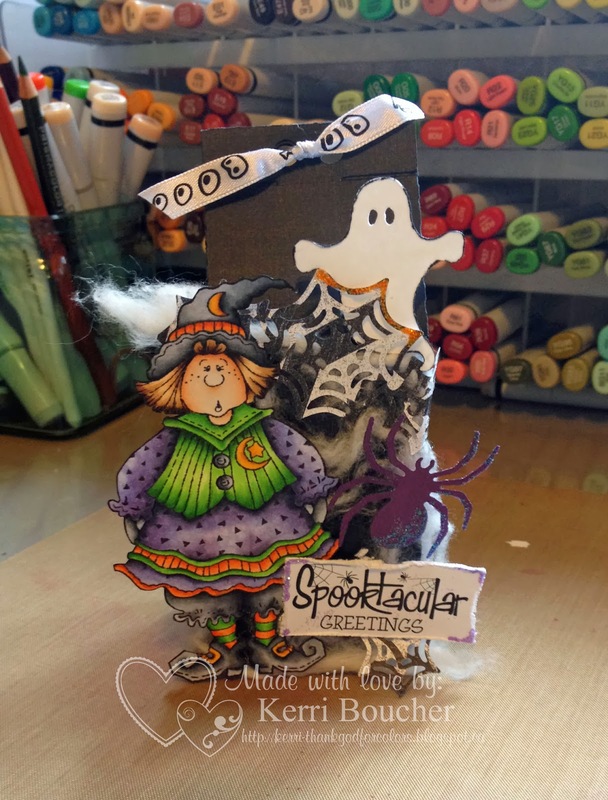 Have a great Halloween, and be sure to check out the winner of this month's challenge here at One Crazy Stamper, which will be announced on Thursday, and then check out the new theme on Friday. Thanks for stopping I am so shocked that it is almost the end of October, time flies by when we are having fun. 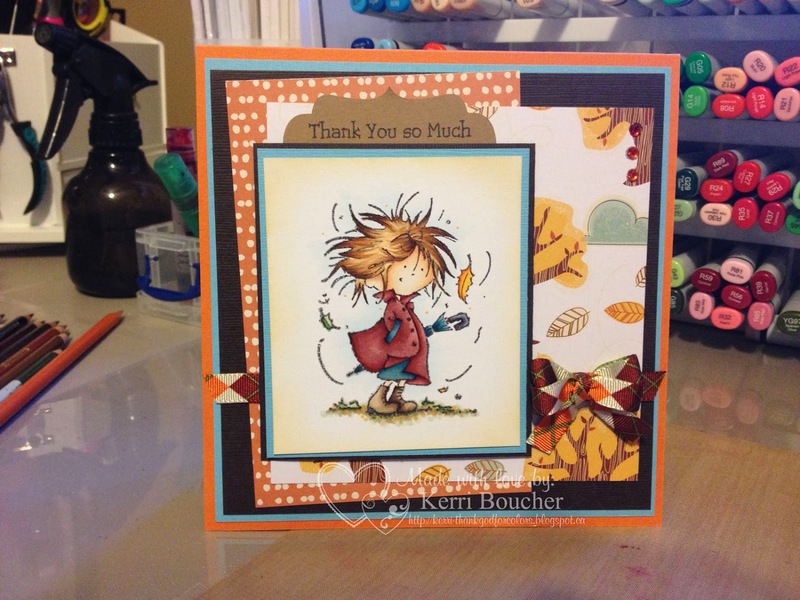 The month of Thankful/Autumn Challenge here at One Crazy Stamper are amazing, the DT has out did themselves, such talent. The entrees we've seen amazing, there is still time to play, so please get your craft groove on. Here is my last card for the challenge. Thanks again for playing sharing the love, and I hope you get in your craft room! Stop by Lora's store and have some fun shopping! Till next time, Happy Crafting! Supplies: Bo Bunny Pattern Paper-Autumn Song, Yellow Rhinestones, Sentiment-Computer, Spellbinders, Memory Box Die, Distressing tool, Dauber for inking edges, Glue Dots, Foam Squares. 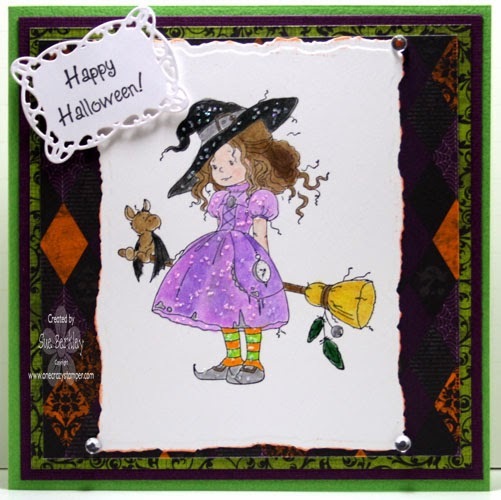 As Halloween is almost here, I thought I would use this adorable image from Whimsy Stamps called Hazel for today's post for One Crazy Stamper. There are still a few more days left to enter this month's Autumn / Thankful challenge for a chance to win a prize pack from One Crazy Stamper. On Friday, check out One Crazy Stamper for a brand new challenge. While you are being creative, do check out Lora's store One Crazy Stamper to help your creativity as new products are arriving daily. Did you know... It Is Only 2 Months Till Christmas!!! Hello and Happy Friday! Since today is the 25th of the month that means that it is only 2 months until Christmas so I decided to show you a Christmas card to celebrate the countdown to the big day! Today I not only have an adorable image to show you that I am very proud of how the colouring turned out, as well as a technique that you may not have tried yet and is easy to incorporate into your card making and scrapbooking - Glitter Ritz! On this card all the red accents you see (the scalloped circle and the outline of the sentiment) were all done using Glitter Ritz to help make the card sparkle! So with only 2 months till Christmas, have I inspired you to get started on your Christmas cards too? Good Morning and welcome to another Wednesday at One Crazy Stamper. Isn't Fall a wonderful season? I am just enjoying it so much and the weather is still clear and sunny yet just crisp enough for sweaters and fires in the evening. I recently drove by a field of gorgeous sunflowers all ready to give away their seeds and that was the inspiration for the card I have to show you today. It once again uses a stamp from the High Hopes stamp line called "Single Potted Sunflower". I stamped it three times, twice close together on a sheet of Copic paper and once by itself to cut out and pop. It is a simple note card with no sentiment that could be used for any purpose. Thanks for coming by today. You still have time to enter our "THANKFUL/AUTUMN" challenge for the month of October. You could win 2 "Little Darling" stamps. 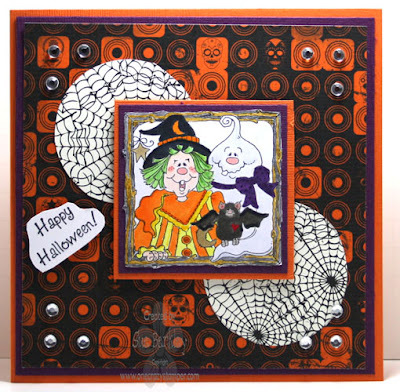 Today's card features another beautiful image from Whimsy Stamps Wee Stamps artist Sylvia Zet, and displays this months challenge theme for One Crazy Stamper of Thanksgiving or Halloween. The image is Wyanet available here and I have used Copics to color her. The image was then cut and matted with a Spellbinders die, and then mounted on paper from My Mind's Eye. Butterfly dies from Cherry Lynn, and floral flourishes from Memory Box frame the image. The butterflies received a coat of Icicle Stickles, and the beads and star on her outfit have Turquoise Viva Decor Pearl Pen accents. You still have over a week to enter the monthly challenge here at One Crazy Stamper to win a fabulous prize - check out all of the details by clicking on the icon at the top of this blog. Thanks for stopping today, our challenge here at One Crazy Stamper is Thankful/Autumn, I wanted to share my thanks to my friend, and I love this image and stamps from Heartfelt Creations! 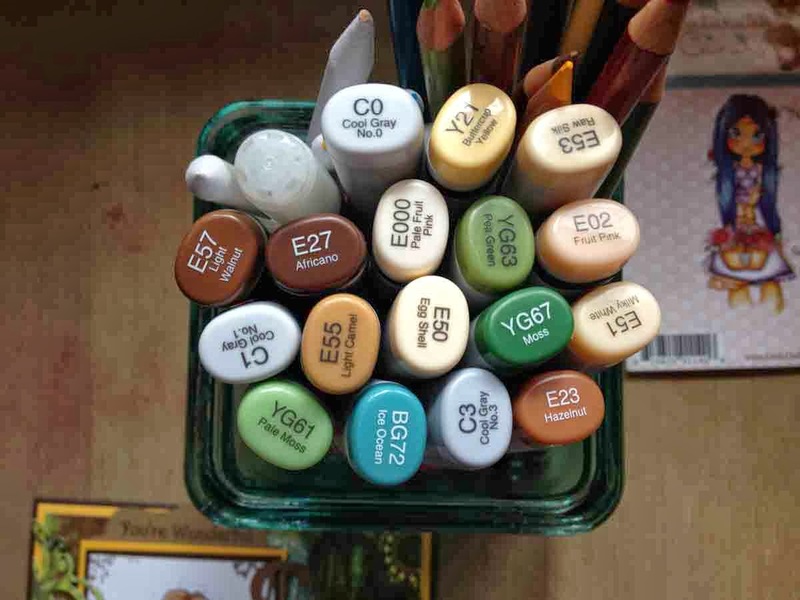 Please play along with OCS and pop over to Lora's store here, and do some shopping, always can find something wonderful there. I do hope you get into your craft room today, and inspire someone with your talent. Till next time Happy Crafting! 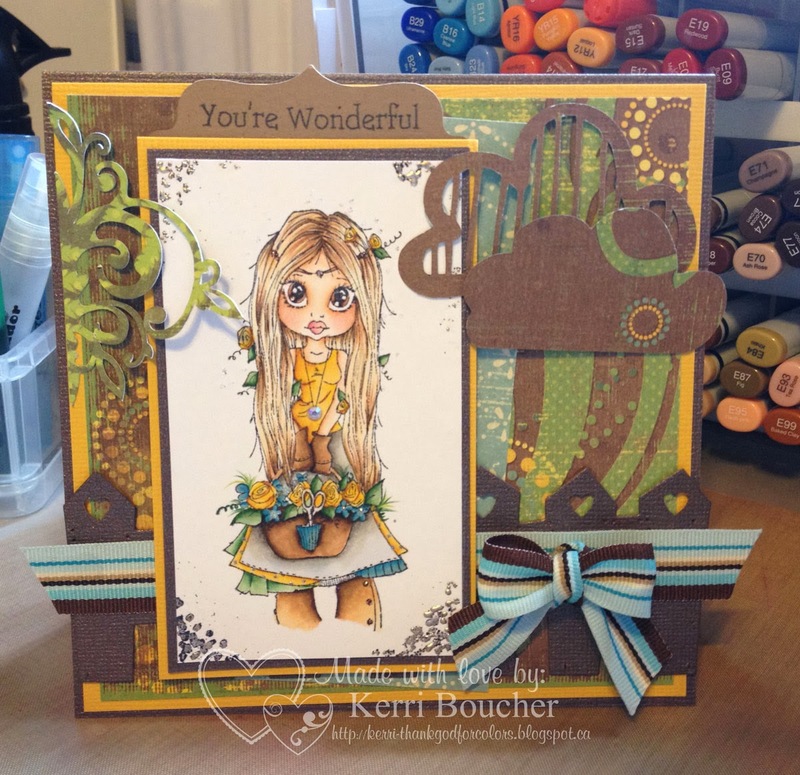 Supplies: Pattern Paper-Bo Bunny-Autumn Song, Heartfelt Creations Stamps - Antique Lantern, flowers, pearls, dauber for inking edges, Spellbinders, Copic Markers-BG90, YG95, YG00, E81, E84, YG97, YR24, YR23. 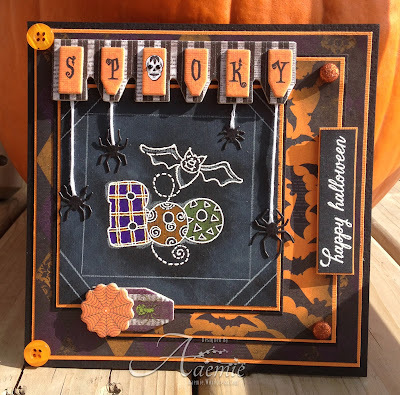 As Halloween is around the corner, for today's post for One Crazy Stamper, I have used this cute stamp from High Hopes called Boo Crew in a Frame. There is still time to enter this month's Autumn/Thankful challenge for a chance to win a prize pack from One Crazy Stamper and do check out Lora's store for all the new products that are arriving daily. I have a fun tutorial to share with you all today! It's called black magic and its perfect for so many projects but especially Halloween cards. I had so much fun creating this video and card, I hope everyones enjoys and gives it a try. Make sure to check back in next saturday for a 2nd tutorial with another technique that I have to share! Thanks for visiting today, I hope you enjoyed my card =) See you again next week! Well as you can tell from the post today is Thursday!! Where did my week go? For my card today I used a SC image and she is called GARDEN GAYLE...This is one of my favs I think I have coloured her seven or eight times..she can be used for so many things..GAYLE was coloured with COPICS and SHADED with PRISMA PENCILS!! 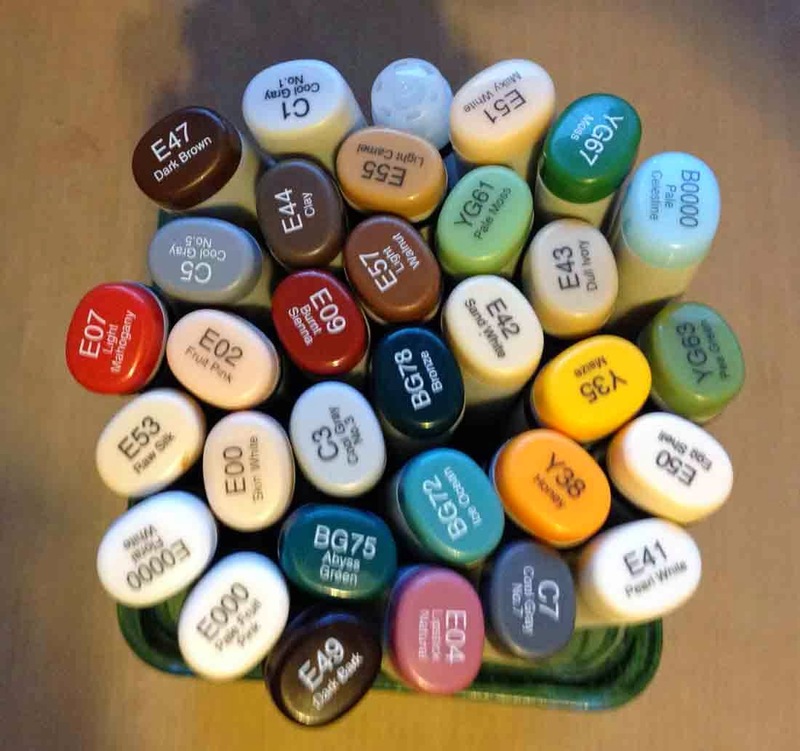 all of these supplies can be found over at ONE CRAZY STAMPER and please join us for our challenge the theme is AUTUMN/THANKSGIVING..There is some great prizes to be won..
Good Morning. 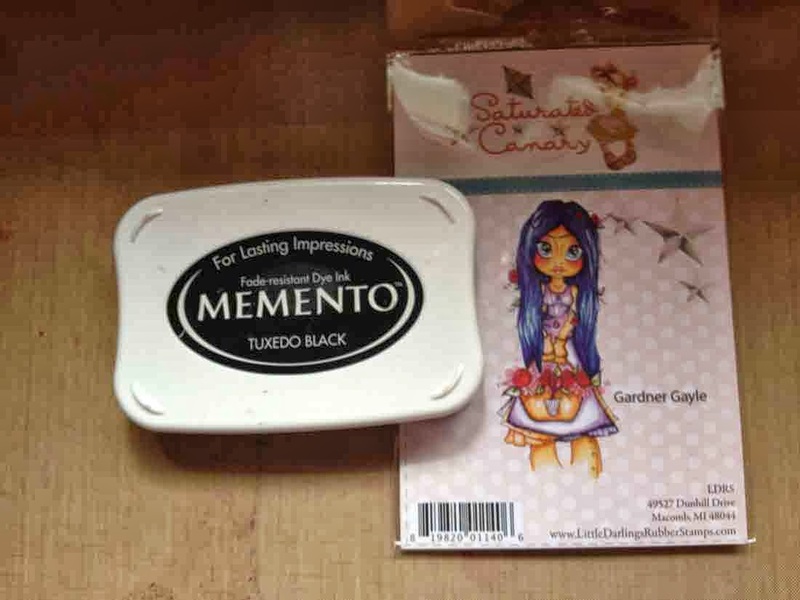 Another Wednesday is here and my turn to show you a project here at One Crazy Stamper. We celebrated my hubby's birthday on Friday and I have his card to show you today. It uses a super cute image from High Hopes. Lately they seem to have become my "go to" company for all of my stamping needs. I bet you could find an image in their line for almost anything you wanted to make. Thanks for dropping in today. There is still lots of time for you to join us for our "AUTUMN/THANKSGIVING" themed challenge for the month of October. Until I see you again, keep crafting. Happy Hump Day. Wow, hard to believe but it's only a couple of more weeks until one of my favorite holidays will be here - I love Halloween almost as much as Christmas - the ghosts and goblins will be out prowling the streets. My card this week features the adorable image Hazel from Whimsy Stamps Wee Stamps collection, and fits the theme for this months challenge at One Crazy Stamper. I colored the image with Copics then cut it out with a Spellbinders die, then used an Antique Linen Distress Ink pad to color the background. The edges of the die shape were also inked with Memento Tuxedo Black ink. The dp is from My Mind's Eye Happy Haunting collection, which is also where the "Scary" word came from. I used two Memory Box dies to cut the spider web and spider for the corner of the card front. The hints of glitter on the spider were created with a Sakura Star Dust pen. Don't forget to check out the beautiful creations from the rest of the design team and enter the monthly challenge to win a fabulous prize. Thank you for coming to see what I've come up with for One Crazy Stamper Tutorial. I've never done this before so if it looks somewhat confusing I am sorry. Stair Step Card with a twist, which is the front cover on it. Cut two Pieces of Cardstock, I used Black for my card: One 8.25 x 5 and one 6.75 x 5 I have in the following photos shown the steps. I wrote out the score and cut lines on the first photo. Open up and you can see the numbers. Once you have cut and scored the step part of the card you can fold as in the following photo. The cardstock that is 6.75 x 5 and it is scored at 1.5 this part goes underneath, I just add some adhesive and line it up. Then time to decorate it. This card I made last month, and liked it so much I made another. I also made one similar to this for my Dad's birthday, but didn't add the front part, it will stand up if you wish not to add the front cover. Thanks for stopping and I hope you get a chance to get crafty! Have a Frightfully Fun Birthday! !